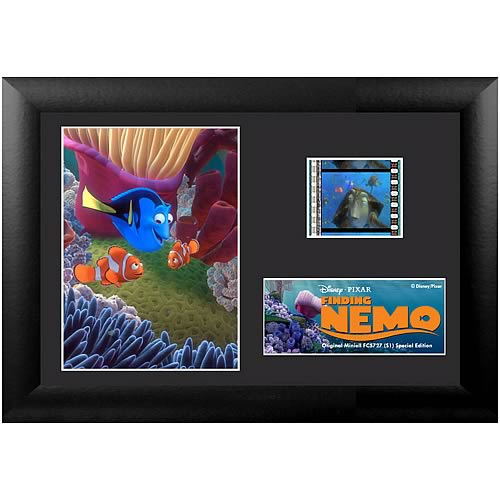 Shopping for Finding Nemo / Finding Dory Film Cells? From the Academy Award - winning creators of Toy Story and Monsters, Inc. (2001, Best Animated Short Film, For the Birds), it's Finding Nemo, a hilarious adventure where you'll meet colorful characters that take you into the breathtaking underwater world of Australia's Great Barrier Reef. Nemo, an adventurous young clownfish, is unexpectedly taken to a dentist's office aquarium; it's up to Marlin, his worrisome father, and Dory, a friendly but forgetful regal blue tang fish, to make the epic journey to bring Nemo home. Their adventure brings them face-to-face with vegetarian sharks, surfer dude turtles, hypnotic jellyfish, hungry seagulls, and more. Marlin discovers a bravery he never knew, but will he be able to find his son? The film strip portrayed in the image above is only an example of the film cells you may receive. Please note, the cells may vary from piece to piece because they are hand selected from reels of film. This item contains clips of the film and portrays memorable images and scenes all on a stunning descriptive plaque. These elements have been double mounted and placed within a beautiful black wood frame measuring 7-inches wide x 5-inches tall. The Finding Nemo Series 1 Special Edition Mini Cell even comes with a certificate of authenticity.